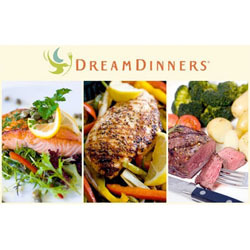 Dream dinners are designed for busy individuals and families who does not have time to prepare healthymeals. These meals can be ordered online where is it prepared by staff on location. Dream dinners have 14 different recipes each month, along with additional pre-assembled dinners, sides, breads and desserts ready for purchase while in one of our stores. With your help we can reach more people and let them know about Dream Dinners whether this product works or not. Very convenient but sometimes not very tasty and quite expensive unless you buy into a good deal. Be prepared to add some flavor. Also, its not very much food... I'm not sure what they are using to gauge serving number but it was grossly underestimated for my family lol!